Beautiful Elegant Collection from GREEN FROGS Designs. 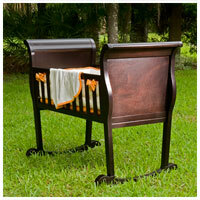 Unique Juvenile furniture Cribs, Cradles and Decorative Accessories for your Babies Nursery. 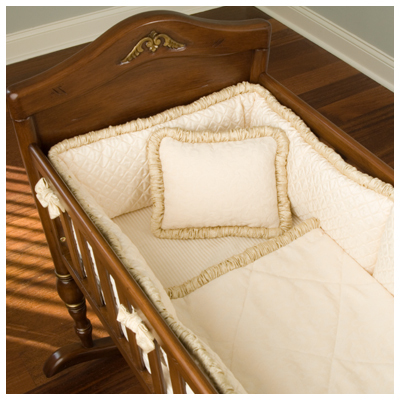 We Carry All wood Baby Cribs & Cradles to luxurious fabric bedding comforters, pillows for Your Child's Nursery Room. All these Classic styles of cradle's come in Antique style finishes for children in Sleek, Contemporary, & Old World Designs. Specializing in Classic Green Frog Unique Cradles! ***We MATCH or BEAT any PRICE!! Start your own Tradtion with this Antique Style Old World Crib Heirloom or Cradle using this Timeless Crib for your Babies Room Furniture. Pass it on in your family, to be treasured for generations to come! 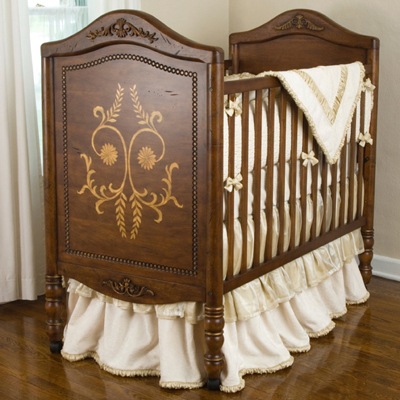 All Wood:Cradle for Nursery, New Born, Old World Crib for Babies Room, Antique Style Juvenile Furniture. We carry the Matching Luxurious Bedding, Comforters, Sheets and Pillows too!! 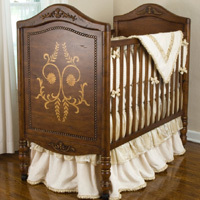 Own this Classic Old World Crib furniture to pass it down for generations to come in your family! 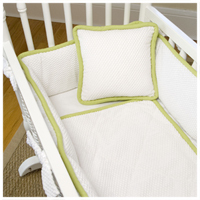 NOTE: ALL Green frogs Cribs and Cradles are made with NON-TOXIC Paints or Stains and MEET OR EXCEED the current ASTM SAFETY Standards! We can ship directly to the New Parents to be!! Begin a Family Heirloom Tradition with this Old World Crib Babies room furniture with its Timeless Crib design for your new born childs babys room nursery. Pass it on in your family, to be treasured for generations to come! 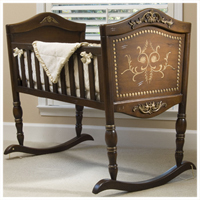 Old World Childs Crib Antique Style or Cradle for Nursery, Real Wood New Born, Babies Room, Juvenile Furniture. We carry the Matching Luxurious Bedding, Comforters, Sheets and Pillows too!! 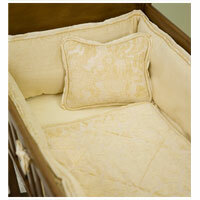 This is the Last few left of Old World CRIBS we carry, so hurry Before it is sold out. On SALE!!! NOTE: Crib shown here is the OLD WORLD CRIB on sale !! Hurry before they are sold out! 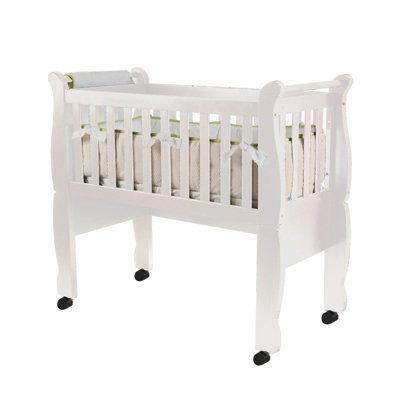 *Note: This White cradle below....It now comes with scallop bottoms on all four panels of cradle. New images coming. Same Style, just a little tweak on the design of the bottom of cradle. Comes with: 4 Tall legs: With 4 Caster rolling feet for bottom of tall legs and also option included to use the Rocker Feet to attach to bottom of legs if you like this White Cradle to rock instead. Baby Cradle for Babies room for Baby Girl or Baby Boy White Cradles made out of real wood. 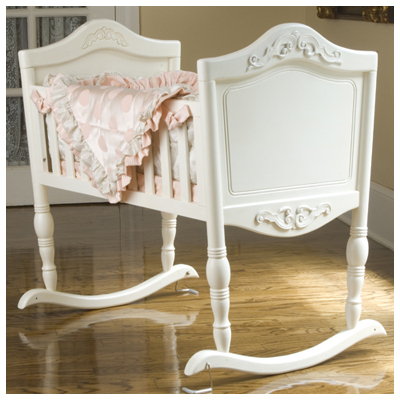 Babies Cradle for New Born, Infants Nursery, Babies Room, Childrens Juvenile Furniture. Bedding NOT included. Approx SIZE Infant CRADLE Above Approx: 42"L X 20.5" W. Standard 18" x 36" Cradle interior, 37" overall height from ground in tall confirguration. Sleep surface is 18.5"
Finished in Matte White or Deep Expresso Chocolate brown color, Top High Quality Firm Cradle Mattress INCLUDED with purchase of cradle. Mattress SIZE: 18" x 36". INCLUDED, Tall Stationary Cradle legs w/Casters, Rocker kit. Bedding not included. 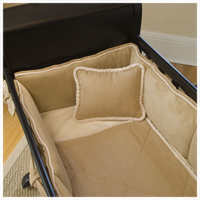 Cradle is recommended for babies up to 25 Lbs. Who are not yet pushing up yet with their hands or knees.Recommend to use bumpers on all Cradles Cradles meet or exceeds all current safety standards. *Note: This Brown Espresso cradle below....It now comes with scallop bottoms on all four panels of cradle. New images coming. Same Style, just a little tweak on the design of the bottom of cradle. Comes with: 4 Tall legs: With 4 Caster rolling feet for bottom of tall legs and also comes with option to use the Rocker Feet to attach to bottom of legs if you like as a cradle rocker . Baby Girl or Baby Boy Rocking Cradle in real wood. 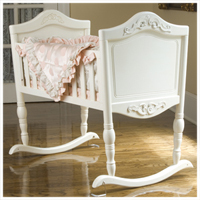 Babies Cradle for New Born, Infants Nursery, Babys Room Cradle, Childrens Juvenile Furniture. Bedding NOT included. SIZE Infant CRADLE Above Approx: 42"L X 20.5" W. Standard 18" x 36" Cradle interior, 37" overall height from ground in tall confirguration. . Sleep surface is 18.5"
Cradle is recommended for babies up to 25 Lbs. Who are not yet pushing up yet with their hands or knees. Recommend to use bumpers on all CradlesThey meet or exceeds all current safety standards. NOTE: ALL Green frog Cradles & Cribs are made with NON-TOXIC Paints or Stains and MEET OR EXCEED the current ASTM SAFETY Standards! Wood Babies room Cradle for Baby Girl or Baby Boy Antique White Cradles in Wood , Baby Cradle for New Born, Infants Nursery, Babies Room, Childrens Juvenile Furniture. 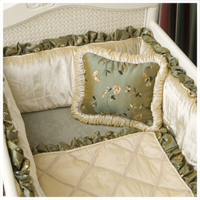 Cradle is recommended for babies up to 25 Lbs. Who are not yet pushing up yet with their hands or knees.Recommend to use bumpers on all Cradles. They meet or exceeds all current safety standards. 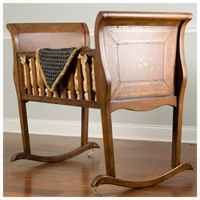 All Wood Cradles: New Born Babies Room, Babies Cradle for your Childs Nursery, Infant Juvenile Furniture. We carry the Matching Luxurious Bedding, Comforters, Sheets and Pillows too. Bedding NOT included! Start your own Tradtion with this Antique White Cradle Heirloom using this Timeless Cradle design for your infant babies Room Furniture. Pass it on in your family, to be treasure for generations to come! Mission style Infant cradle. Allegro Cradle for Girl or Boys babies room in Wood , Baby Cradle for Infants Nursery, Babies Room, New Born,, Childrens Juvenile Furniture. 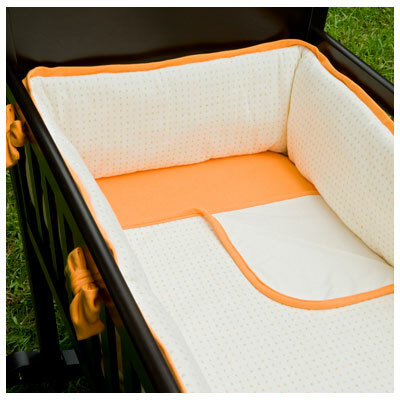 Cradle is recommended for babies up to 25 Lbs. Who are not yet pushing up yet with their hands or knees.Recommend to use bumpers on all Cradles.They meet or exceeds all current safety standards. 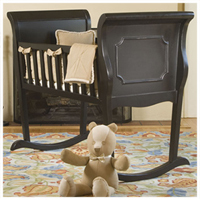 All Wood: Babies Cradle for your Childs Nursery, Infant New Born, Babies Room, Juvenile Furniture. We carry the Matching Luxurious Bedding, Comforters, Sheets and Pillows too. Bedding NOT included! Start a Family Heirloom Tradition with this Mission Style Cradle Furniture for your childs room with its Timeless Cradle design for your new born childs baby room as furniture . Pass it on in your family, to be treasure for generations to come! Antique Style Heirloom Wood Old world Cradle for Nursery, New Born, Boys or Girls Babies Room, Juvenile Furniture. We carry the Matching Luxurious Bedding, Comforters, Sheets and Pillows too!! 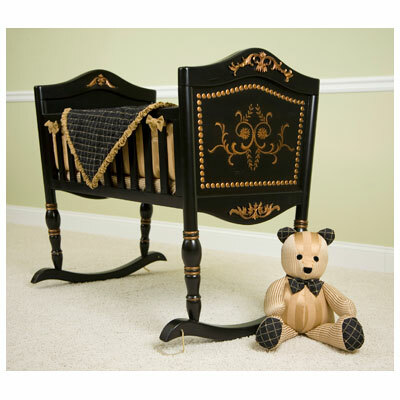 When a child outgrows this Old World Cradle, it can become a piece of accent furniture...just fill it with toys for a toy chest, dolls , blankets or stuffed animals, and it will be a treasured heirloom for your family to pass down for generations to come! NOTE: ALL Green Frogs Cradle and Cribs are made with NON-TOXIC Paints or Stains and MEET OR EXCEED the current ASTM SAFETY Standards! Baby Cradle & Cribs in Wood, Old World Cradle for Baby Boy, Baby Girls room. Real All Wood Baby Cradle for Infant Nursery, New Born, Babies Room, Childrens Juvenile Furniture. 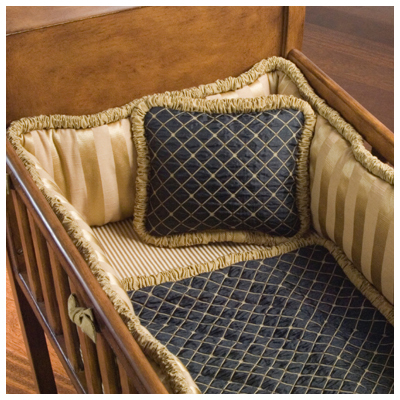 This Old World Antique Style Cradle will be a treasured heirloom for your family to pass down for generations to come! When a child outgrows the cradle, it can become a piece of accent furniture...just fill it with toys for a toy chest, dolls , blankets or stuffed animals! 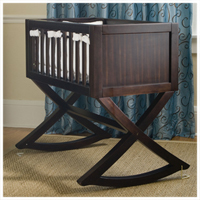 Cradle for Nursery, New Born, Babies Room, Real Wood Cradle Juvenile Furniture. Cradle Babies room for Baby Girl or Baby Boy Antique White Cradles from Green Frog, Baby Cradle for New Born Infants Nurseries , Babies Room. SIZE Approx: Higher than 36"H X 18"W X 39.5"L (exterior); 36"L X18"W ( interior) . To rails height is approx 29"
Top Quality Cradle Mattress INCLUDED with purchase of cradle Hardware Included (Kick stand) to stabilize the rocking motion if desired. NOTE: ALL Green frogs Cradles are made with NON-TOXIC Paints or Stains and MEET OR EXCEED the current ASTM SAFETY Standards! Cradle is recommended for babies up to 25 Lbs. Who are not yet pushing up yet with their hands or knees. Recommend to use bumpers on all Cradles. They meet or exceeds all current safety standards. Babies Room Cradle for Nursery, New Born, Real Wood Cradle Childrens Juvenile Furniture. A treasured heirloom for your family to pass down for generations to come! When a child outgrows the cradle, it can become a piece of accent furniture...just fill it with toys for a toy chest, dolls, blankets or stuffed animals! White Baby Cradles for Childs room made out of real wood. 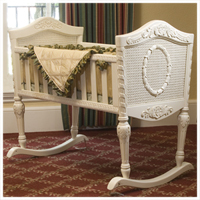 This Babies Antique White Cradle heirloom, it can become a piece of accent furniture, when a child outgrows it...just fill it with toys for a toy chest cradle, dolls , blankets or stuffed animals, and it will be a treasured heirloom for your family to pass down for generations to come. NOTE: ALL Green frogs Baby Cradles & Cribs are made with NON-TOXIC Paints or Stains and MEET OR EXCEED the current ASTM SAFETY Standards! 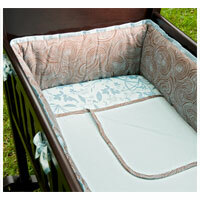 Cradle is recommended for babies up to 25 Lbs. Who are not yet pushing up yet with their hands or knees.Recommend to use bumpers on all CradlesThey meet or exceeds all current safety standards. All Custom Made Bedding below can only be done if Fabric material is available in the Market Place.MADE to order! We also sell Carousel Horses for Children's room decoration or table Centerpiece. In all sizes, up to life size Horse! All made out of durable resin. The Carousel horse comes with a Brass pole and wood base, Or choose a music box base,or Lamp style as shown below. We carry over 10 Styles Our Carousel horses and 9 top selling colors to pick from! All Made & Hand Painted by Artisians in the USA !! We carry 4 styles in our Full Life Size Carousel Horses. In all sizes, up to life size Horse! All made out of durable resin. The Carousel horse comes with a Brass pole and wood base, Or choose a music box base or in this style, our ROCKING horse base . Our Carousel horses we have over 10 Styles to pick from in 9 top selling colors! All Hand Painted in the USA . We carry 4 styles in our Life Size Carousel Horses above. Bedding SET INCLUDES IN PRICE 3 piece cradle Set: The sets come with three pieces: Bumper, Coverlet, and one fitted sheet. (Additional sheets and accent pillows can be purchased as extras). NOTE: Sheets are Machine washable. the rest may be hand washed or spot cleaned with mild, chlorine detergent. NOTE: All Custom Made Bedding can only be done if Fabric material is available in the Market Place. Bedding SET INCLUDED IN PRICE SET INCLUDES IN PRICE 3 piece cradle Set: The sets come with three pieces: Bumper, Coverlet, and one fitted sheet. (Additional sheets and accent pillows can be purchased as extras). NOTE: Sheets are Machine washable. the rest may be hand washed or spot cleaned with mild, chlorine detergent. Bedding SET INCLUDED IN PRICE 3 piece cradle Set: The sets come with three pieces: Bumper, Coverlet, and one fitted sheet. (Additional sheets and accent pillows can be purchased as extras). NOTE: Sheets are Machine washable. the rest may be hand washed or spot cleaned with mild, chlorine detergent. Bedding ORGANIC SET INCLUDED IN PRICE 3 piece cradle Set: The sets come with three pieces: Bumper, Coverlet, and one fitted sheet. (Additional sheets and accent pillows can be purchased as extras). NOTE: Sheets are Machine washable. the rest may be hand washed or spot cleaned with mild, chlorine detergent. Bedding ORGANIC SET INCLUDES IN PRICE 3 piece cradle Set: The sets come with three pieces: Bumper, Coverlet, and one fitted sheet. (Additional sheets and accent pillows can be purchased as extras). NOTE: Sheets are Machine washable. the rest may be hand washed or spot cleaned with mild, chlorine detergent. SET INCLUDES IN PRICE 5 piece Comforter Sets: The sets come with five pieces: Bumper, Coverlet, 2 tiered crib skirt with a sheer overlay and one fitted sheet. (Additional sheets and accent pillows can be purchased as extras). NOTE: Sheets are Machine washable. the rest may be hand washed or spot cleaned with mild, chlorine detergent. 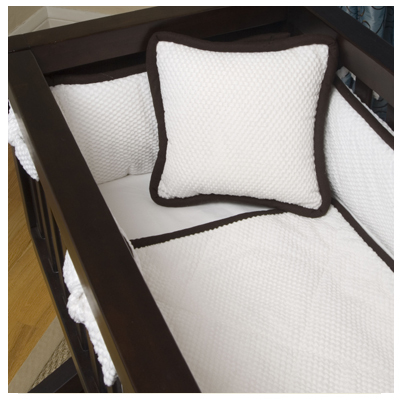 We carry 2 styles of bedding for CRIBS. 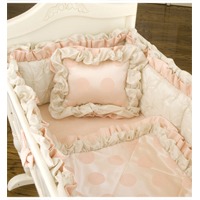 The sets come with five pieces: Bumper, Coverlet, 2 tiered crib skirt with a sheer overlay and one fitted sheet. Additional sheets and accent pillows can be purchased as extras. NOTE: Sheets are Machine washable. the rest may be hand washed or spot cleaned with mild, chlorine detergent. NOTE: All Custom Made Beddingcan only be done if Fabric material is available in the Market Place. NOTE: Crib shown her by Green Frog is No longer available SOLD OUT!!! AVAILABLE IN 4 COLORS: Trimmed in: Chocolate, Lime, Strawberry, Mist. NOTE: Crib shown here is No longer available SOLD OUT!!! SET INCLUDES IN PRICE 4 piece Comforter Sets: The sets come with four pieces: Bumper, Coverlet, 3 tiered ruffled crib skirt with ONE fitted sheet. (Additional sheets and accent pillows can be purchased as extras separately). NOTE: Sheets are Machine washable. the rest may be hand washed or spot cleaned with mild, chlorine detergent. NOTE: All Custom Made Bedding can only be done if Fabric material is available in the Market Place.START A WISH LIST! Not available. Check back in 9 months to see if New styles of Dresser's are coming back in. 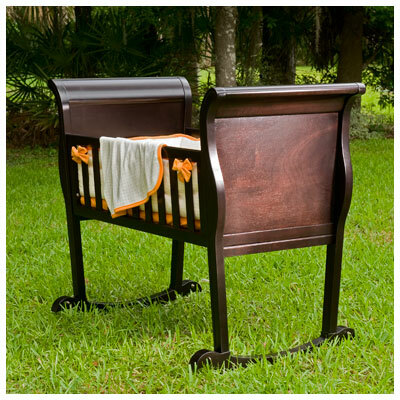 Accent furniture practical Changing table top and dresser 3 draw for your babies Nursery and forever a classic show piece of fine furniture for your childs bedroom! Timeless piece to last forever to grow with your child! 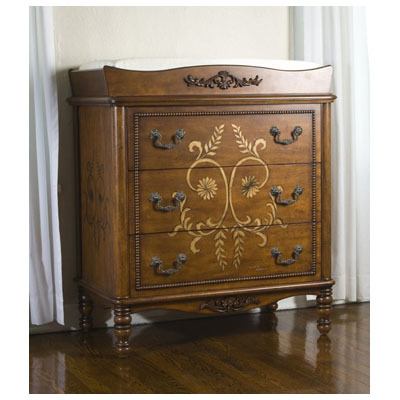 Matching babies changing table Dresser three draw cabinet and later the changing table top can be taken off and the furniture can be used as a classic piece of Old World furniture to last a life time in any room! Not available. Check back in 9 months to see if New styles of Cradles are coming back in. Cradle is recommended for babies up to 25 Lbs. Who are not yet pushing up yet with their hands or knees.TRecommend to use bumpers on all Cradles. They meet or exceeds all current safety standards. 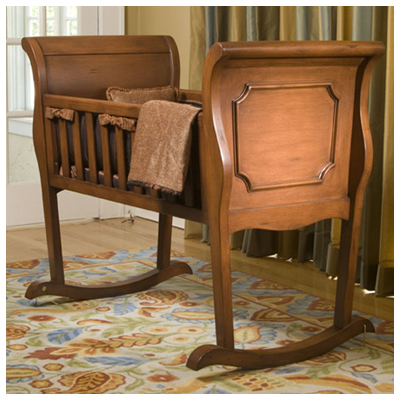 All Wood:Cradle for Nursery, New Born, Babies Room, Juvenile Furniture. We carry the Matching Luxurious Bedding, Comforters, Sheets and Pillows too!! 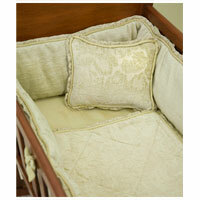 We carry 4 styles of bedding for CRIBS. 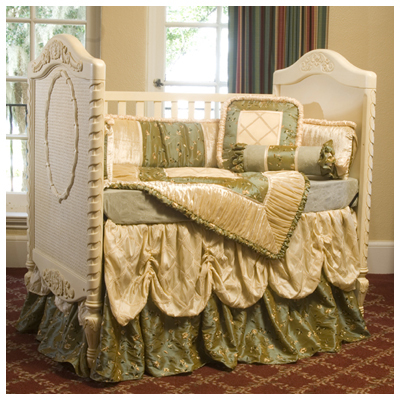 The sets come with five pieces: Bumper, Coverlet, 2 tiered crib skirt with a sheer overlay and one fitted sheet. Additional sheets and accent pillows can be purchased as extras. NOTE: Sheets are Machine washable. the rest may be hand washed or spot cleaned with mild, chlorine detergent. NOTE: ALL Green Frog Art cradles & Cribs are made with NON-TOXIC Paints or Stains and MEET OR EXCEED the current ASTM SAFETY Standards! All Real Wood:Cradle for Nursery, New Born, Babies Room, Juvenile Furniture. We carry the Matching Luxurious Bedding, Comforters, Sheets and Pillows too!! NOTE: ALL Green frogs Cradles & Cribs andare made with NON-TOXIC Paints or Stains and MEET OR EXCEED the current ASTM SAFETY Standards! When a child outgrows the cradle, it can become a piece of accent furniture...just fill it with toys for a toy chest, dolls , blankets or stuffed animals, and it will be a treasured heirloom for your family to pass down for generations to come! Cradle is recommended for babies up to 25 Lbs. Who are not yet pushing up yet with their hands or knees.They meet or exceeds all current safety standards. Email : joans.gifts@verizon.net or southbeachgifts@verizon.net NEED more detailed info ??? Teddy Bear to Custom match your Bedding set for the Crib or Cradle. Accessories to buy separately. 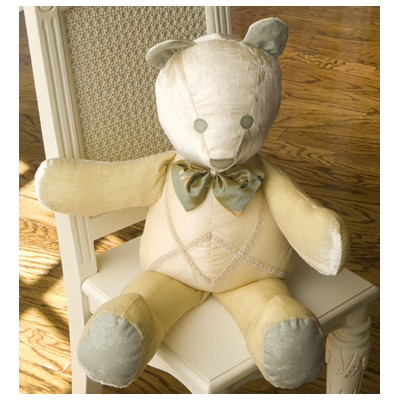 Anton the Bear Price Each: $ 130.00 hand made in the USA and dressed in Exquisite fabrics. Anton comes dressed in several different fabrics, each one coordinating with one of our bedding sets designer Collection. Or just get it to match your bed room decor for you nursery or child's room!130. Teddy Bear to Custom match your Bedding set for the Crib or Cradle. Accessories to buy separately. Anton the Bear hand made in the USA and dressed in Exquisite fabrics. Anton comes dressed in several different fabrics, each one coordinating with one of our bedding sets designer Collection. Or just get it to match your bed room decor for you nursery or childs room! Teddy Bear to Custom match your Bedding set for the Crib or Cradle. Accessories to buy separately. Anton the Bear 0 hand made in the USA and dressed in Exquisite fabrics. Anton comes dressed in several different fabrics, each one coordinating with one of our bedding sets designer Collection. Or just get it to match your bed room decor for you nursery or childs room! Teddy Bear to Custom match your Bedding set for the Crib or Cradle. Accessories to buy separately. Anton the Bear hand made in the USA and dressed in Exquisite fabrics. Anton comes dressed in several different fabrics, each one coordinating with one of our bedding sets in the Aspine designer Collection. Or just get it to match your bed room decor for you nursery or childs room bedding that we carry!130. NOTE: All Custom Made products can only be done if Fabric material is available in the Market Place. Teddy Bear to Custom match your Bedding set for the Crib or Cradle. Accessories to buy separately. 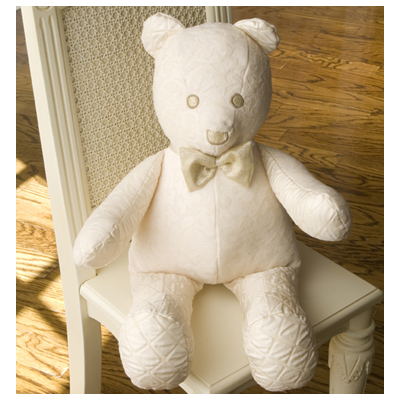 Anton the Bear Price Each: $ 130.00 hand made in the USA and dressed in Exquisite fabrics. Anton comes dressed in several different fabrics, each one coordinating with one of our bedding sets in the "MOD Frog" designer Collection. Or just get it to match your bed room decor for you nursery or child's room! Personalize it! Bears are available with MONOGRAMMING on their foot only, Either a single initial or up to THREE initials monogram for an additional charge of only $20.00 EXTRA towards the price of the Bear..(shipping is not included in price)..Perfect baby shower gift 130. 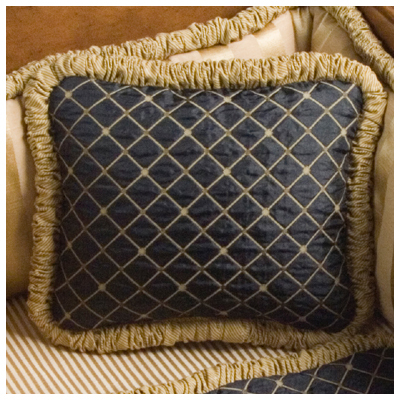 Choose from 4 Different Colors BELOW to be TRIMMED IN: Chocolate, Mist, Lime Green, Strawberry ( shown below) pillow. Personalize it! Pillows are available with MONOGRAMMING, Either a single initial or up to THREE initials monogram for an additional charge of only $20.00 EXTRA towards the price of the pillow.50. Aspine Round CRIB pillow. Price each: $ 176.00 (one piece) made with the best of the Luxurious bedding fabrics.You will find these designs timeless and both Unique and functional! !All polyester filling new. Made in the USA.Can be hand washed or spot clean with very mild chlorine free detergent. Add a special touch to any girls room, baby room, entry foyer or family room with this elegant table lamp. The lamp is cast in resin with soft pink hand painted details and is topped off with a uniquely shaped shade,featuring a fresh polka dot design and coordinating tassels. SIZE: Height to top of shade approx. 27 1/2"
Requires only a 60 watt bulb. Nicole Square pillow $ 250.00 each. ( one piece) Size: ( 14.5 inches Square) All polyester filling new. Made in the USA.Can be hand washed or spot clean with very mild chlorine free detergent. Nicole Tootsie Roll pillow $176.00 each ( one piece) Size: . ( 22" x 5 inches) All polyester filling new. Made in the USA These extras of the crib or Cradle Nicole pillow made with the most Luxurious bedding fabrics.You will find these designs timeless and both Unique and functional!! Size: ( 9" x 11" inches) All polyester filling new. Made in the USA.Can be hand washed or spot clean with very mild chlorine free detergent. Choose from 4 Different Colors to be TRIMMED IN: Chocolate, Mist, Lime Green, Strawberry ( shown below) pillow.